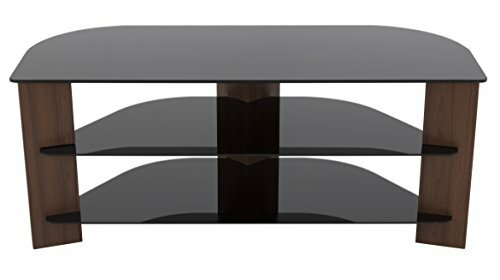 The FS1100VARWB-A (Varano) is a stylish, understated, ready to assemble TV Stand in Walnut wood-effect. The black tempered glass shelves support a TV up to 88 lbs (up to 55"), as well as AV components up to 22 lbs per shelf. The angled back corners allows for multiple positioning options, as it can be placed flat against a wall or into a corner of a room, providing ideal viewing angles for a larger area. The two lower shelves are perfect for AV components such as Digital Receivers, DVRs, Blu-ray, or Gaming Consoles. Installation is kept neat via the built-in cable management with entry and exit points along the length of the column so all power and connectivity wires can easily reach the equipment in an organized, tidy fashion. If you have any questions about this product by AVF, contact us by completing and submitting the form below. If you are looking for a specif part number, please include it with your message.